I took months researching a new theory about the disruptive impact that technology is having on the restaurant industry. I would like to share with my readers, in this article, A brief summary of these new ideas. To understand the disruptive process in restaurants, it is necessary to analyze it from a historical perspective, identifying key elements in the relationship between customers and restaurants. unidirectional: The beginning of the relationship has been basically in one direction, Restaurant customers, since they are the ones who decide the right time to start your dining experience. limited: It occurs only during consumption of the product and service, starting and ending in the restaurant itself. Presential: the physical presence of the customer in the restaurant is necessary for the relationship takes effect. bidirectional: El inicio de la relación también se da, Restaurant customers, as these begin to participate in personal relationships based on digital environments, mainly through social networks, providing information, interaction and talk to customers. Unlimited: La relación se amplía y se digitaliza, ya no se limita única y exclusivamente a la experiencia presencial del cliente, it starts in most cases in digital environments, in the inspiration step, It moves to the eating experience and continues through digitization stage reputation. No presential: La presencia física del cliente ya no es necesaria en el restaurante para relacionarse con él, digital environments allow this relationship can practically carrying out all stages, if we exclude the gastronomic, this becomes the great challenge of the future, be able to translate sensory experience through technology. This paradigm shift, causes the appearance of what I have called the RESTAURANTS UBIQUITOUS, que tienen como principal característica poder dar una respuesta a las exigencias de este nuevo entorno, donde los clientes tienen movilidad, accessing information when and where they want, and have connectivity with other users. 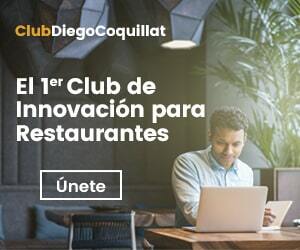 In this new context, the challenge of the ubiquitous restaurant, ha de ser la utilización de la tecnología para lograr relacionarse con sus clientes al mismo tiempo en los diferentes entornos digitales y presenciales, because the new customer is choosing where to live your dining experience. further, the restaurant has to understand that the customer relationship is moving, customer experience is no longer limited by location, the scanning process allows this point to how, where and when, since it has enough for this technology and this changes the static view we currently have restaurants. The challenge for the industry, It begins by assuming that the restaurant door is not wood nor crystal, It is often, It is already digital.